The Prince’s Trust is one of Britain’s best known charities, supporting thousands of young people every year to get their lives back on track. They came to us looking for expert help in transforming their successful Future Steps challenge into an app, allowing workplace teams to get fit and raise money for The Trust. The new app would need to streamline the process of signing up, raising money, tracking steps or other activity and sharing progress via social media, thus reducing the administrative burden on the Future Steps campaign team. The project also was on a tight schedule, needing to be ready for initial release in a narrow 10-week timeframe, so we hit the ground running. The project had very clear goals and we quickly worked through defining what the functionalities would be for the first version of the app vs future versions. We workshopped the various user roles and journeys and defined requirements for the differing needs of administrators, team leaders, participants and their devices. During a series of sprints we worked in constant communication with the digital team at The Prince’s Trust to simultaneously develop wireframes for each user experience, technical architecture, branding and design and marketing language and UI. We chose an Amazon RDS instance to house the data, ensuring high levels of encryption and privacy by design. The advantage of our team’s experience with React Native allowed us to build both iOS and Android apps from a single codebase, integrating with their native health apps and Fitbit. 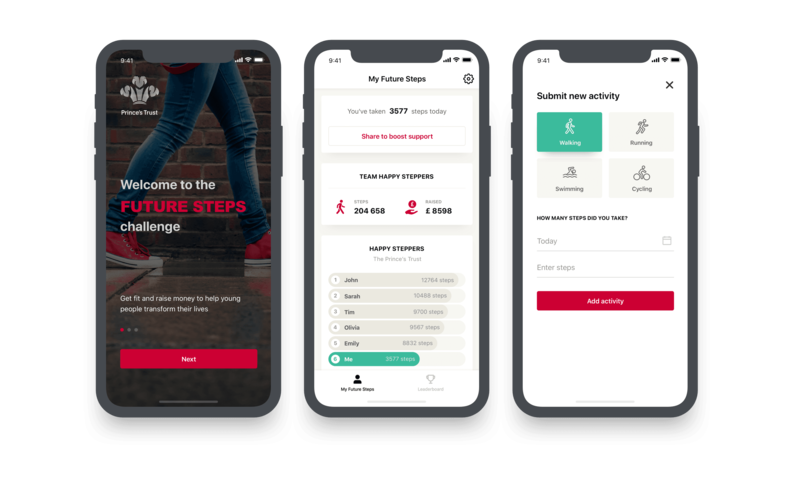 The Future Steps app was launched on schedule, within 10 weeks, and work continued to deliver the next version as planned. The initial feedback [about the app Despark built] was highly positive. A lot of people who participated in the event last year and this year said it was much easier because of the app.